Are you looking for a new avenue to earn money from your artistic talents? Daz Studio might just be the perfect fit for you. Read on to learn how this 3D program grew from humble beginnings to becoming world class and how others are profiting from its success. 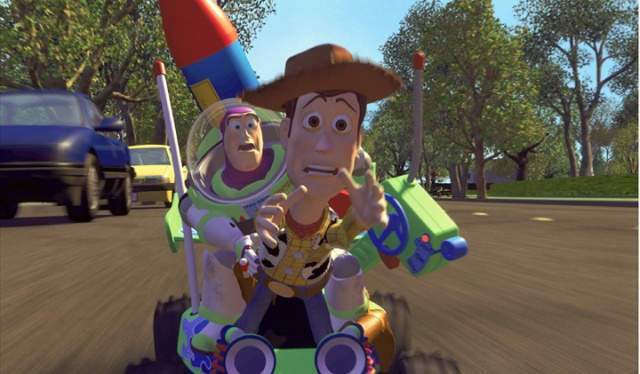 I can still remember watching Toy Story back in 1995. I was only ten years old and the excitement I felt at watching these computer generated characters dance around on the screen was amazing! At the time I only had access to a very basic PC which must have been running Windows 3.1 or thereabouts with an early pentium processor. I remember thinking how incredible it would be if I could make my own animations. Unfortunately I didn’t stand much of a chance back then as I wasn’t even able to get my machine to boot up half the time! My how things have changed. The capability of even basic computers today is phenomenal by comparison to my childhood days. Not only are computers more powerful they are also cheaper. Wouldn’t it be great if there was a fully capable 3D art and animation suite that could take advantage of this power… and didn’t cost the earth? Let me introduce Daz Studio. Daz is a free 3D suite used by hobbyists, and professional artists all over the world. Its boasts a wide range of features ranging from the rapid creation of digital artwork to full 3D animation. In simple terms it is like having your own virtual photography studio, with an unlimited supply of models, props, vehicles and environments. It sounds cheesy but the only true limits are your imagination. The program is easy to learn and has an intuitive and fully customisable interface. You can pose ready made characters and props to produce interesting artwork in minutes. In addition you can set up sophisticated photo realistic lighting effects and render more complex scenes and animations with ease. Daz boasts the Nvidia Iray rendering engine. In basic terms this allows you to create photo realistic visuals by simulating the physical behaviour of light and materials. To understand this better, imagine shining a flash light on a mirror. The light will bounce and scatter in a variety of ways, illuminating the surrounding area. If you shine it at a non reflective surface the effects will be less dramatic. Iray calculates all of these effects and renders them for you. Because this technology is created by Nvidia it can take full advantage of Nvidia based GPU’s, just like video games do to create realistic 3D art in a very short amount of time. 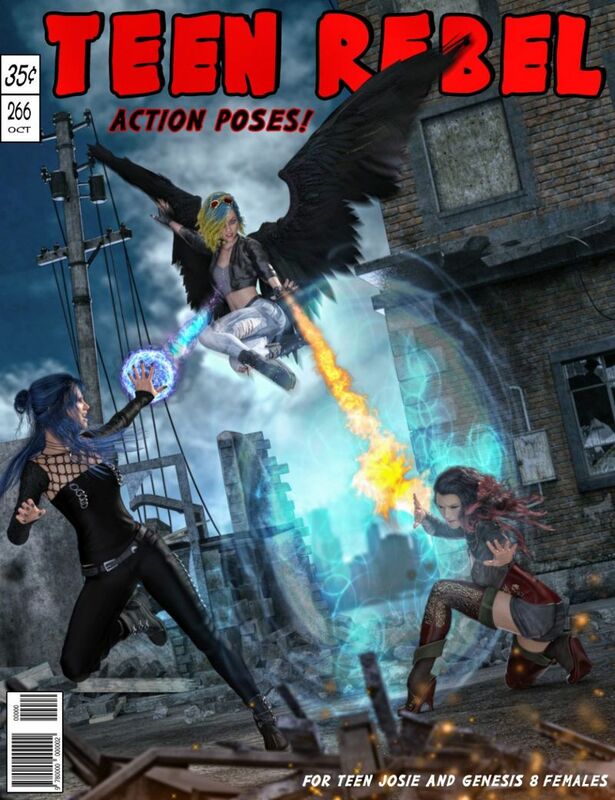 Daz studio features tons of free (and paid) content directly on the daz3d marketplace. It’s one of the main reasons why so many people use it. As soon as you have the program installed you can bring people, animals, vehicles, props, environments, cameras, lights and whatever else you need into your scene to create a unique piece of art. It is easy to use for beginners and due to its popularity there are many tutorials available all over the web to help you take your art to the next level. In addition to this there are the Daz forums where you can post questions to experienced users to help you along the way. There is a thriving community of Daz 3D artists on many popular art sites such as deviantart that also regularly offer advice and content. If we’re going to talk about the beginnings of Daz Studio we have to talk about Poser as the two are intrinsically linked. Poser was the original 3D art and animation suite. It was heavily optimised for human character modelling and featured a full range of customisable clothing and props. Eventually users were able to create full scenes with a huge variety of props. The program gained huge popularity due to its user friendliness. A huge community of model creators also emerged to satisfy the demand for poser models. Poser was originally created by Larry Weinberg who was a talented artist and programmer. It has changed ownership many times over the years. It was originally published by Fractal Design in the 90’s. Poser was then taken over by MetaCreations and changed ownership a few more times! The latest and current publishers are Smith Micro. Dan Farr, Chris Creek and the Digital Art Zone! Chris Creek was an experienced artist who had worked in a variety of different art jobs. He knew a lot about human anatomy as he had illustrated several medical journals over the years. One of his jobs involved working for a company called Viewpoint Data Labs. Viewpoint must have been an interesting company to work for as they provided special effects to the star trek franchise in the early 90’s. It was here that he was first introduced to the concept of 3D modelling. After spending time honing his skills he and a few other employees broke away from Viewpoint Data Labs to create Zygote Media Group. This project gave Chris and his colleagues more freedom and they specialised in creating anatomical 3D models for medical publishing companies. After five or six more years Chris once again felt he needed to grow towards a new direction. He and Dan Farr broke away from Zygote Media Group to create Digital Art Zone. Or to put that another way… DAZ Studio!! In those early days Daz was a content hub only. There was no studio application and their focus was to provide content mainly for Poser. With the emergence of other content hubs such as content paradise Dan and Chris had to rethink their plans. They didn’t want to be so heavily reliant on the success of Poser alone. Additionally if they were forced to sell their products through another market place such as content paradise their profits would be diminished. It was within this climate of competition that the concept of Daz Studio as we now know it emerged. Dan and Chris immediately hired people to help them develop their ideas. They also bought three other software applications called Hexagon, Bryce and Carrara. 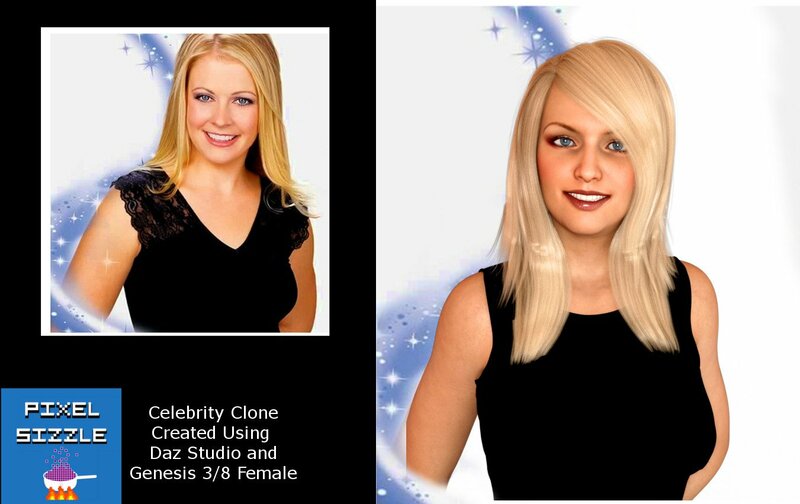 Daz studio is primarily used to create a scene or animation with pre existing 3D models. You can create your very own 3D models or edit existing ones using Hexagon. Hexagon is free with Daz Studio and is a fully featured 3D modelling application in its own respect. If you want to learn more about Hexagons features click here. Bryce is used to create 3D landscapes that can be used in Daz and other applications. It is very powerful and has won several awards. Their are tons of features which you can learn more about here. Carrara is a fully featured 3D graphics application. It is not free as opposed to other daz software. You can use it to pose and edit your figures, as well as nature modelling. It is also capable of traditional modeling, animation, texturing and rendering. The software is capable of dynamic hair and fur simulations, particle effects, soft body and rigid body dynamics. It is under constant development so please check that the latest version is compatible with the figures you want to use. We understand that many of you will be reading this article to learn if Daz Studio is feesable for you to earn an income with. Well if you are creatively minded and patient enough to learn the basics, the sky really is the limit. Here are just a few ways that people earn a living with art created in Daz. Recently we were researching the use of cartoon shaders when we came across several artists who make their own graphic novels exclusively with Daz Studio. We remember this kind of artwork being generated by old school poser users but it seems that there is a whole new generation of illustrators using Daz for this kind of work. Indeed it makes sense as the quick and easy character posing lends itself perfectly to creating a sequence of comic book renders . We thought this was wonderful as the startup costs are zero, besides requiring access to a reasonable computer. Many have been able to use the free tools to earn money and then buy extra assets from the marketplace to make their graphic novels even better. We have also seen Daz Studio used by artists to provide fast artwork for book covers, movie posters and music albums to name just a few. It may seem obvious, but selling your art in whatever form is an obvious way to earn money with Daz. The rapid creation with Iray rendering means you can be highly productive and create a portfolio of your work on online marketplaces. Ron Mendell is a seasoned prop and set designer who has worked on many hollywood blockbusters from Hook to Jurassic World. He used Daz studio to create the concept art for Captain America, Thor and Iron Man. Really the tools are flexible enough to be used for any type of concept art or to create quick scene plans and layouts. Character creation is an obvious strength for Daz Studio. You can then export your scenes to other 3D applications if necessary. 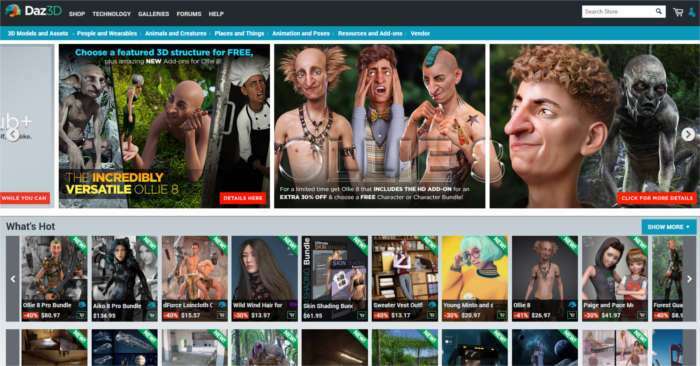 When you are comfortable with daz you can earn money by creating content for the thriving marketplace on daz3d.com. Daz relies on a growing community of artists to create content that is exciting and innovative. Your models, props and pose sets could end up being featured in a video game or animated movie. If you are already an accomplished 3D modeller you can submit your models right away. It is quite easy to create pose sets for existing characters and you can carve out an audience for yourself by being unique and creative. Don’t be disheartened if your work is initially rejected by daz. If it is interesting enough the team at Daz studio will work with you to get content up to standard. You’ve heard about what Daz Studio has to offer. The only thing left to do is use it yourself! You can sign up for a free user account and download it here. We hope you enjoyed this review and can’t wait to see what you create!